Sony may have thought that its console cross-play beta – which currently supports Fortnite and Rocket League – would buy it some time, but it looks like that’s running out. 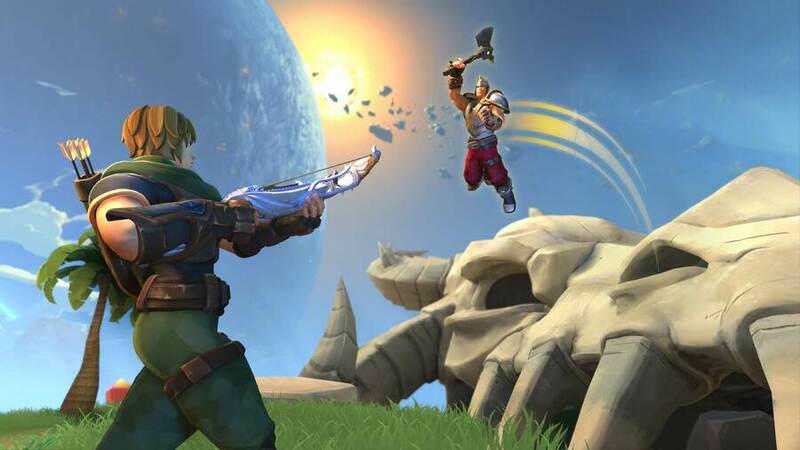 Hot on the heels of War Thunder developer Gaijin Entertainment – who says it’s in regular contact with the Japanese giant about adding console cross-play and is yet to get clearance – Hi-Rez Studios has called the company out. For those of you who haven’t been keeping up, the PlayStation maker launched a console cross-play beta last year, initially with Fortnite. It’s since opened up the programme to Rocket League, but some developers are frustrated that it’s not accepting applicants quicker. The company’s yet to comment on its roadmap, so expect the pressure to mount if it remains silent. @FullbringIchigo Some people feel that it's not a "real" beta, just a way of allowing Sony to pick and choose. Sony just can’t catch a break, can they? I mean, the devs are not wrong, but I guess it’s not that easy to implement cross-play. Hey war thunder... only makes me want to play your game less. this is not about playing favourites. this is sony playing smart for checking the beta with the most popular games that fit the cross play mode. not their fault that war thunder and paladins etc can't seem to get the playerbase that rocket league and fortnite have etc. It helps to get some attention on your games by stoking the hot topic flames. Especially when a new free to play game has just come to market and is probably stealing your customer base. I wonder if those games truly are all ‘ready to go ‘ or it’s another Bethesda bluff. How much Phil Spencer is paying these guys? I don't know why we're all assuming (then again I do) that Sony isn't doing what the studios are accusing. I'm not saying they are holding a fake beta, but there's literally no indication that it's one way or the other, we don't know what's going on behind the closed doors at Sony. Only time will tell. These studios should know better then to strong arm Sony, you never when you might need them to promote your game. For the most part all Sony needs to do to allow cross play is pick up the phone to the dev and say OK, go ahead. It is 100% contractual issues that stop it, not technical. Some devs may have run separate code sets and backends but for most it will just be a DB flag. Sony does not do anything to enable cross play beyond allowing it. Yeah come on Sony. I've got a working PS5 prototype ready to go here. Just waiting for you on this. How come all of these free-to-play companies are making a thing out of this on Twitter? I feel like it's bad PR to do this. If Gears for Breakfast gets a bunch of backlash for a clap emoji reply when someone asks about a Switch port, then how come this is praised? Do people really have a "we must band together to stop the big, bad, bully Sony" mindset? People sure like complaining over nothing. I think most people these days can recognise a blatant PR effort when they see one. @Deadlyblack IDK, I think it has to do with people playing with friends on other systems. I really don't think it's a big deal but you know how people in this day and age like to complain. @FullbringIchigo Worked fine for Xbox and Switch so far.... Sony are just trying to waste time and are being choosey with who they pick. This has very little to do with 'Testing' - Where was the 'beta' for 'testing' with Xbox and Switch? Its annoying and not for the gamer. Who cares?... Cross-play's just about the least interesting thing Sony could implement. Seems to me only devs care about it... Or at least not a lot of gamers do in comparison. As soon as I hear any studio cry about cross play I add them to my blacklist. Focus on making better games, if you need crossplay that badly it means your game is doing poorly, deal with it. @RawnDawn I know what it's about, but it seems like the only companies that are making a stink are the ones that only make free-to-play games. @SuperJoon Not for the gamer? Sony is bringing me high quality exclusive games, that is the single most important thing.... GAMES. I don't want cross play. As a console player we are at a major disadvantage in Shooters and even something ubiquitous like Rocket League benefits from zero lag on PC. If you don't think there's an advantage you are either a fool or ignorant. @FullbringIchigo But Sony needs need to give them a roadmap then. @TheMCnoisy What about at least Xbox and Switch? It would be great for friends with different consoles and for keeping playerbases alive. I don’t think shooters will ever have PC crossplay because of the advantage. I’ve never thought about the lag though. I hope the cross-play storm will rise again. Then we’ll see that no one really cared. I think people having some patience is a better description. Yes, all this talk and criticism about ps4 not enabling crossplay. How about a story about xbox one requiring xbox live to play free to play games? To be fair, while I think it's a bit unprofessional going public, it's also not great of Sony to be avoiding giving developers a timeline behind-the-scenes. If a studio asks, they should really be responding and saying, "We're in beta now, everything's been going fine, we plan to add X and Y to the programme in March, and we're aiming a full roll-out in the summer." Something as simple as that would probably put a stop to this. If the communication's bad then of course there's a backlash. @Deadlyblack I don't think it's only company's that are making a stink are the ones who want it, unless Fortnite is a stink but I do think it helps with finding matches in games. I play paladins from time to time and it could take up to 2 min. to find a match (though that's on a bad day) but maybe cross-play will help with that. I don't know man, like I said. I could care less about cross-play. I'm more interested in cross-save/progress rather than cross-play, it will be great if I can play wargroove on switch on the go and continue it on my ps4, it will make me buy the game on ps4 although I already have it on switch. Rocket League suffers from terrible lag spikes with crossplay enabled, so I had to turn it off just to play a match. @SuperJoon They only wanted it after getting destroyed. They declined it with FF14 online because it was without Xbox Live and nobody talks about that. Last generation on top no we dont want it. @jly1987 well said. Finally a voice of reason. @jly1987 so if you need XBL on the systems because they are designed to be closed so they can't connect to each other then how can a simple switch flip do it as well? you contradicted yourself in your own statement and Fortnite is different because they don't run through PSN or XBL but have their own servers, now for games that are like that yes it would be easily done but for a game running on Sony servers or MS servers it's a hell of a lot more difficult than "flipping a switch"
@FullbringIchigo I never said that fortnite ran on its own sever and not Xbox live or song. You literally just made that up. Yup. Nothing wrong with calling Sony out on crossplay, especially since it was Sony who decided recently to dip its toe in the water. But it is funny to me how mainstream multiplatform websites like IGN, Kotaku, etc don't seem to cover the Xbox free-to-play issue at all. But people want to act like game journalism is at its peak today. We can get wonderful 'think pieces' about how Resident Evil doesn't allow people to be a compassionate hero (somebody really wrote nonsense) but lets just forget about real news. Seems to me Sony's communication has been bad for a while. And it's not just with consumers at this point, but devs too. I know people here don't like when this is said, but the signs of arrogant, obnoxious Sony are starting to creep back in and I don't like it. Remember last gen when MS didn't want this, and it wasn't an issue? got to love all the doom & gloom people on here get a grip will you what are you 12 years old or something when it is out of BETA it will be ready & game companies acting like muppets sending out tweets is embarrassing. this feature is so important all of sudden lol. @David187 The stupidity in these comments is unreal, Sony isn't running a Beta, cross play requires ZERO input from Sony. It's purely a legal grip they have over developers. Fortnite was cross play without them even knowing, the developers can literally flip a switch and enable cross play. @themcnoisy cross play allows me to play games with My kids who now love many hours away, I can play and talk to them no matter what device they use, if your that bothered about a competitive advantage don't join cross play lobbies, it's not rocket science. sony plays favourites to its own users?. what a shocker. this was never an issue until sony wiped the floor with the other consoles. some of us don't want cross-play against other platforms, and i have yet to see that in games that do support it, it's something you can opt out of. @DirectAim how can they just flip a switch beyond silly it will create stress on the network which has to be checked. that is great you want to play with ya kids but this was not a feature when you got the systems so just wait & have some patience! stop this flick a switch mentality not how things work. @DirectAim Or buy them a PlayStation? @themcnoisy I have done, literally bought my daughter a PS4 yesterday. Previously she had an Xbox 360. The point I was making was that cross play is useful and welcomed by many people, just because you deem it an unfair advantage... I presume because your a "pro gamer" doesn't mean it not a fantastic move in the right direction for many people. Kids especially find this useful, the fact my son can play with his friends from school who are using a Switch or Xbox is a wonderful and fantastic feature. @David187 Epic Games literally enabled cross play without ANY input from Sony. This was reported when gamers noticed they had players from other consoles in their lobby. Also, who do you think runs the game servers? Its cetainly not Sony. Each developer will run their own servers so stress on the network is down to the dev/publisher who by the sounds of it are sat waiting and ready (in the case on War Thunder dev anyways). @DirectAim I do have a Ps4 Pro, so yes I am a pro gamer lol. But the point still stands and cross play gives PC gamers an advantage most of the time. So much so it makes the games unfun as they are mostly competitive. As for kids playing cross playing with their mates I couldn't care less. I wish it didn't exist because now I can't get away from Fortnite across all the forms it takes. I'm not saying communication is bad (especially if it's your kids) but equally left unchecked peados will be running rampant without any security of a one company ecosystem. Also Epic are flipping huge. What Epic (25 years in the industry with the world's leading 3rd party game development software) can do and bring to the table is not what most software developers are capable of. So for them to flick a switch might take another company years. @FullbringIchigo that’s how everything is. It’s either a dedicated server or it’s a host. Your CONSOLE uses Xbox love or PSN. @DirectAim Sony has a huge network if your the dev on 1 game hitting a switch is easy when it is a million upon million player Network very different. @jly1987 my god on 1 game hitting a switch is easy to do! do you not understand the difference between Sony massive online network & 1 game! I don't know. I generally dislike the very popular game websites but while I have my disagreements with @get2sammyb and @shogunrok on certain things I don't feel this website really pushes agendas or anything like that. In fact, I use this site as my main source of gaming info because it avoids so much of the ridiculousness other websites publish.